Mach-One Sword Pinstriping brushes series 101 by Mack Brush Company. This brush is based on an Old Grumbacher striper, although it has a differnet handle that is a little longer than the original. 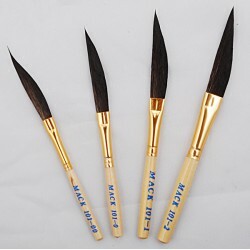 Mach-One Sword Pinstriping brushes series 101 are for Pinstripers and Sign Painters across the world!. These brushes are for pinstriping, design and scroll work. This brush differs from the Original Mach-One is the handle which is no longer made with the Black Plastic, but a wood hande has replaced it and it works very well. Mach-One Sword Pinstriping brushes series 101 have a single edge to pinstripe with, which is different than a pinstripers Dagger brushes which have two sides. Individual Mach-One Sword Pinstriping brushes series 101 Listed Below! Mack Brush Series 101 Size 0 Mach-One Pinstriping BrushThe Grumbacher Company was sold several years ago and the new company discontinued many of..
Mack Brush Series 101 Size 00 Mach-One Pinstriping BrushThe Grumbacher Company was sold several years ago and the new company discontinued many o..